We all take locks for granted as we travel up and down the Thames. These days, the modern electronic controls and smooth hydraulics that are in use at most locks allow easy passage from one river reach to another and the hardest problem for lock keepers to face is simply trying to fit a huge number of boats into the lock chamber. The Thames has been used as a highway for hundreds of years but it was probably the Vikings during their sojourn in the British Isles, who started to put in place the first infrastructure to cope with the problem of varying depths of water, rapids and steep falls in the river’s course. They built dams to maintain the river at levels deep enough to allow navigation. Later, with the establishment of mills by the water’s edge, weirs were constructed to ensure there was sufficient weight of water to turn the mill wheels – but that created another problem – boats couldn’t pass the weirs. And that led to the introduction the first crude locks – known as rymer and paddle locks. 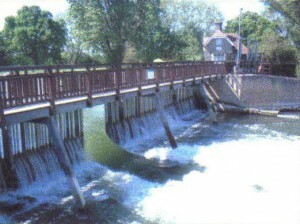 In simple terms, part of the weir was made removable. A beam, which was fixed to the bank or part of the weir, was either swung to one side or pulled across to rest upon the top of the remainder of the weir. Vertical timbers were fixed into slots in a lower beam, or cill, with their tops resting against the upper beam. The pressure of the water held them in position. These were called ‘rymers’. A series of boards about two feet by three feet called ‘paddles’ were attached to long poles, and were then placed against the rymers to hold back the water. And here comes the fun bit. When a boat wanted to pass, the paddles were taken out over a width of about 20 feet. There would be a rush of water through the gap and boats heading downstream would shoot the weir. Boats going upstream would wait for the torrent to subside before being pulled through the gap by a gang of men or a team of horses. Sometimes, they would use a capstan for the job. Needless to say, this could often be a tricky and dangerous process. If the skipper of the boat going downstream got his timing wrong, the level of the water above the weir might drop too much and he’d end up aground. Alternatively, if he went too soon, the rush of water would make controlling the vessel almost impossible. I wonder how many boats ended up as matchwood after careering through these early locks? Probably because of those kind of problems, the rymer and paddle idea was eventually replaced by pound locks – with a central chamber, gates at either end and a number of sluices to allow emptying and filling of the chamber – that we know today. Sometimes technological progress can be a wonderful thing, don’t you think? I’ve heard lots of wonderful anecdotes about locks but I think my favourite was one I read about the lock-keeper at Teddington – where the tidal Thames and the non-tidal river meet – receiving a VHF message from the skipper of some expensive gin palace who was coming up from the Medway and who was running late. The guy simply asked the lockie if he wouldn’t mind leaving both sets of gates open so he could go straight through to try to make up time! I laughed when I read it but there’s a small part of me that thinks it might just be true – which is really worrying!